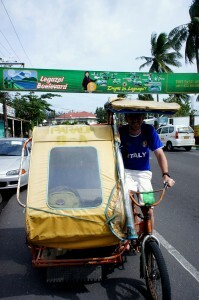 We took a pedicab to the airport with a friendly driver. It was fun to ride inside cart but I wanted a piece of the action. The airport didn’t have stable power, so everything ran off of a generator. The x-ray machine and metal detector both were not powered, which made security basically a breeze. On our ride in a jeep ney we had a friendly admirer. He loved to stare at me. And occasionally, once he built up enough courage, he would stretch his pudgy little hand out to grab my shirt. 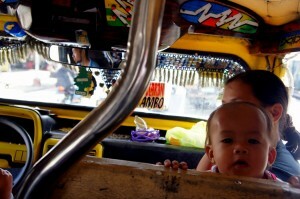 His dad was driving the jeep ney, his mom collected the cash from passengers. Well, I saw my first rice paddy up close and personal. We got into Donsol, self-proclaimed Whale Shark capital of the world. As we pull into our amazing resort, Leah is checking out the restaurant, the beach, the room, and the hammocks. I’m fixated on the rice patties across the street. It is harvesting time and people are in the fields working. 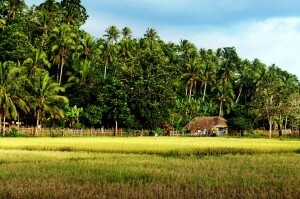 The fields are full of antique farm equipment, rice farmers, and the warm light from a setting sun. What more could a guy ask for. 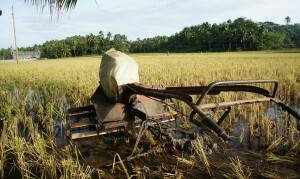 Here is a picture of one of the pieces of farm equipment in the rice field. Here is a couple snapshot of the field. 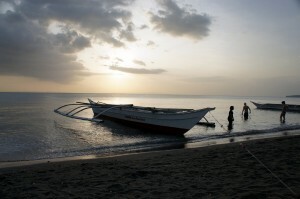 Leah snapped this great photo of the beach beside our hostel.